Are you sure you want to remove "Storage Shed" from My Projects? Whether you are working in a garden or on a construction site, getting the job done is always more efficientwhen your tools are close at hand. Offering just the right amount of on-demand storage, this mini garden shed can handle all of your gardening hand tools but with a footprint that keeps costs and labor low.The mini shed base is built on two 2 × 8 front and back rails that raise the shed off the ground. The rails can alsoact as runners, making it possible to drag the shed like a sled after it is built. The exterior is clad with vertical-board-style cementboard siding. This type of siding not only stands up well to the weather, it is very stable and resistsrotting and warping. It also comes preprimed and ready for painting. Cement siding is not intended to be in constantcontact with moisture, so the manufacturer recommends installing it at least 6" above the finished ground grading.You can paint the trim and siding any color you like. You might choose to coordinate the colors to match your houseor you might prefer a unique color scheme so that it stands out as a garden feature.The roof is made with corrugated fiberglass roof panels. These panels are easy to install and are available in avariety of colors, including clear, that will let more light into the shed. An alternative to the panels is to attachplywood sheathing and then attach any roofing material you like over the sheathing. 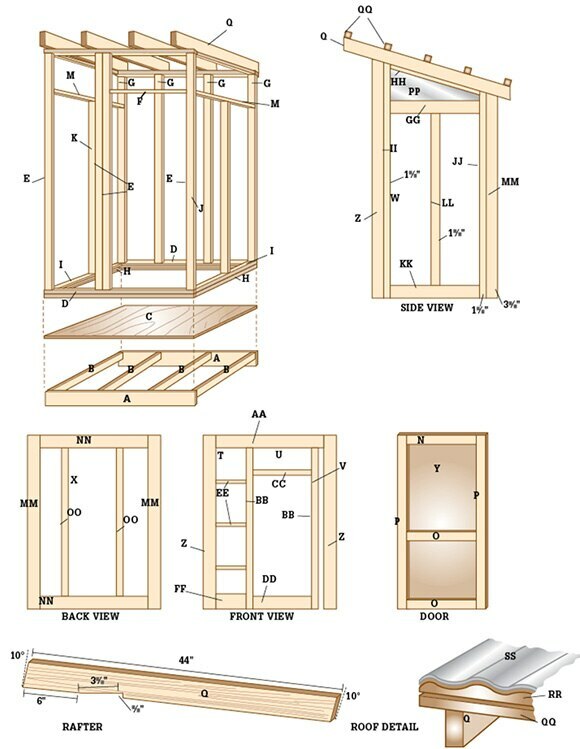 These plans show how to buildthe basic shed, but you can customize the interior with hanging hooks and shelves to suit your needs. This scaled-down garden shed is just small enough to be transportable. Locate it near gardens or remote areas of your yard where on-demand tool storage is useful. Fiber cement siding is sold in 1⁄4"-thick, 4 x 8-ft. sheets at many home centers. There are specially designed shearing tools that contractors use to cut this material, but you can also cut it by scoring it with a utility knife and snapping it— just like cement tile backer board or drywall board. Note: You can also cut cementboard with a circular saw, but you must take special precautions. Cementboard contains silica. Silica dust is a respiratory hazard. If you choose to cut it with a power saw, then minimize your dust exposure by using a manufacturer-designated saw blade designed to create less fine dust and by wearing a NIOSH/MSHA-approved respirator with a rating of N95 or better. Even though moving it is possible, this shed is rather heavy and will require several people or a vehicle to drag it if you build it in your workshop or garage. When possible, determine where you want the shed located and build it in place. Level a 3 × 5-ft area of ground. The shed base is made of treated lumber, so you can place it directly on the ground. If you desire a harder, more solid foundation, dig down 6" and fill the area with tamped compactable gravel. Cut the front and back base rails and base crosspieces to length. Place the base parts upside-down on a flat surface and attach the crosspieces to the rails with 21⁄2" deck screws. Working with the parts upside-down makes it easy to align the top edges flush. Cut the base platform to size. 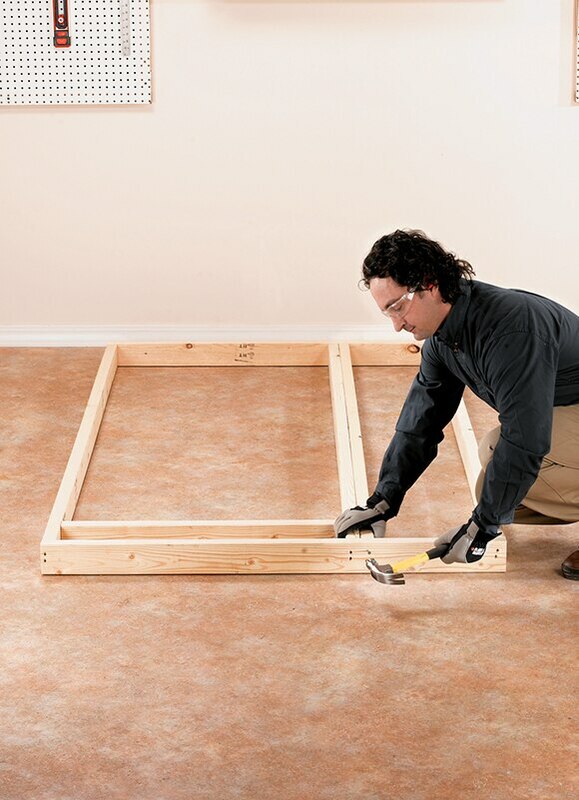 Flip the base frame over and attach the base platform (functionally, the floor) with 11⁄2" screws. Set and level the base in position where the shed will be built. Cut the front wall framing members to size, including the top and bottom plates, the front studs, and the door header. Lay out the front wall on a flat section of ground, such as a driveway or garage floor. Join the wall framing components with 16d common nails. Then, cut the back-wall top and bottom plates and studs to length. Lay out the back wall on flat ground and assemble the back wall frame. Cut both sidewall top and bottom plates to length, and then cut the studs and crosspiece. Miter-cut the ends of the top plate to 10°. Miter-cut the top of the front and back studs at 10° as well. Lay out and assemble the side walls on the ground. Place one of the side walls on the base platform. Align the outside edge of the wall so it is flush with the outside edge of the base platform. Get a helper to hold the wall plumb while you position the back wall. If you’re working alone, attach a brace to the side of the wall and the platform to hold the wall plumb. Place the back wall on the platform and attach it to the side wall with 21⁄2" deck screws. Align the outside edge of the back wall with the edge of the platform. 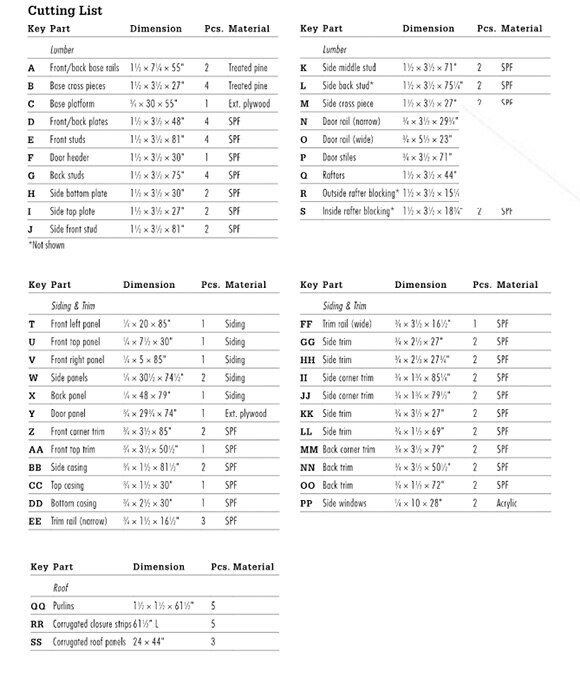 Place the front wall on the platform and attach it to the side wall with 21⁄2" screws. Place the second side wall on the platform and attach it to the front and back walls with 21⁄2" screws. Cut the rafters to length, then miter-cut each end to 10° for making a plumb cut (this way the rafter ends will be perpendicular to the ground). A notch, referred to as a “birdsmouth,” must be cut into the bottom edge of the inside rafters so the tops of these rafters align with the outside rafter tops while resting solidly on the wall top plates. Mark the birdsmouth on the inside rafters and cut them out with a jigsaw. Cut the rafter blocking to length; these parts fit between the rafters at the front and back of the shed to close off the area above the top plates. Attach the rafters to the rafter blocking and to the top plates. Use the blocking as spacers to position the rafters and then drive 21⁄2" screws up through the top plates and into the rafters. Then, drive 21⁄2" screws through the rafters and into the blocking. Toe-screw any rafter blocking that you can’t access to fasten through a rafter. Finally, cut the door rails and stiles to length. Attach the rails to the stiles with 21⁄2" screws. This shed features 24"-wide corrugated roofing panels. The panels are installed over wood or foam closure strips that are attached to the tops of 2 × 2 purlins running perpendicular to the rafters. Position the purlins so the end ones are flush with the ends of the rafters and the inner ones are evenly spaced. The overhang beyond the rafters should be equal on the purlin ends. Cut five 611⁄2"-long closure strips. If the closure strips are wood, drill countersunk pilot holes through the closure strips and attach them to the purlins with 11⁄2" screws. Some closure strips are made of foam with a self-adhesive backing. Simply peel off the paper backing and press them in place. If you are installing foam strips that do not have adhesive backing, tack them down with a few pieces of double-sided carpet tape so they don’t shift around. Cut three 44"-long pieces of corrugated roofing panel. Use a jigsaw with a fine-tooth blade or a circular saw with a fine-tooth plywood blade to cut fiberglass or plastic panels. 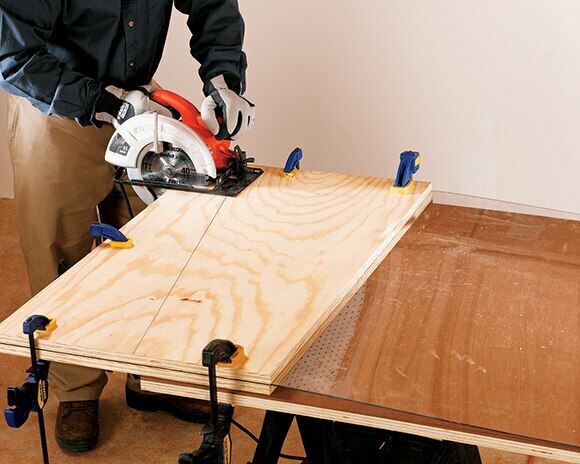 Clamp the panels together between scrap boards to minimize vibration while they’re being cut (but don’t clamp down so hard that you damage the panels). Position the panels over the closure strips, overlapping roughly 4" of each panel and leaving a 1" overhang in the front and back. Drill pilot holes 12" apart in the field of panels and along the overlapping panel seams. Fasten only in the valleys of the corrugation. The pilot hole diameter should be slightly larger than the diameter of the screw shanks. Fasten the panels to the closure strips and rafters with hex-head screws that are pre-fitted with neoprene gaskets. 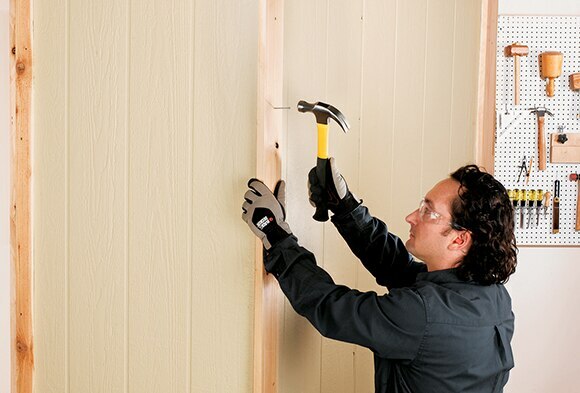 Cut the siding panels to size by scoring them with a utility knife blade designated for scoring concrete and then snapping them along the scored line. Or, use a rented cementboard saw. Drill pilot holes in the siding and attach the siding to the framing with 11⁄2" siding nails spaced at 8 to 12" intervals. 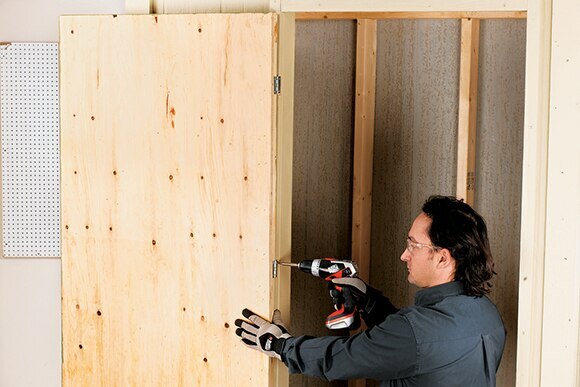 (You can rent a cementboard coil nailer instead) Cut the plywood door panel to size. Paint the siding and door before you install the windows and attach the wall and door trim. Apply two coats of exterior latex paint. The windows are fabricated from 1⁄4"-thick sheets of clear plastic or acrylic. To cut the individual windows to size, first mark the cut lines on the sheet. To cut acrylic with a circular saw, secure the sheet so that it can’t vibrate during cutting. The best way to secure it is to sandwich it between a couple of pieces of scrap plywood and cut through all three sheets. Drill 1⁄4"-dia. pilot holes around the perimeter of the window pieces. Position the holes 1⁄2" from the edges and 6" apart. 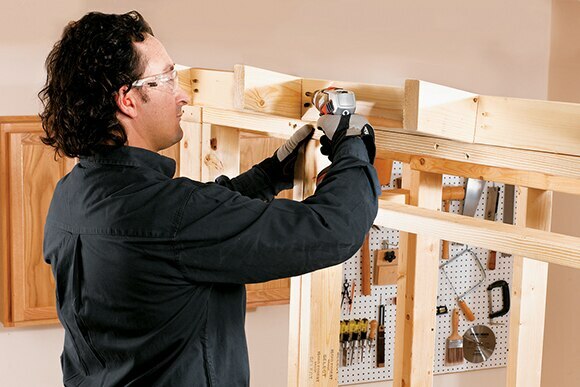 Attach the windows to the side wall framing on the exterior side using 11⁄2" screws. Cut the wall and door trim pieces to length. Miter-cut the top end of the side front and back trim pieces to 10°. 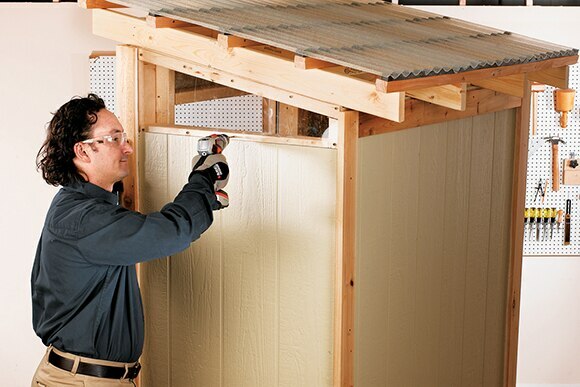 Attach the trim to the shed with 2" galvanized finish nails. The horizontal side trim overlaps the window and the side siding panel. Be careful not to drive any nails through the plastic window panels. Attach the door trim to the door with 11⁄4" exterior screws. Make the door and fasten a utility handle or gate handle to it. Fasten three door hinges to the door and then fasten the hinges to a stud on the edge of the door opening. Use a scrap piece of siding as a spacer under the door to determine the proper door height in the opening. Add hooks and hangers inside the shed as needed to accommodate the items you’ll be storing. If you have security concerns, install a hasp and padlock on the mini shed door. Build the wall frames. For the front wall, attach the plates to the outside studs first and then attach the inside studs using the door header as a spacer to position the inside studs. Raise the walls. Use a scrap of wood as a brace to keep the wall plumb. Attach the brace to the side-wall frame and to the base platform once you have established that the wall is plumb. Fasten the wall frames. 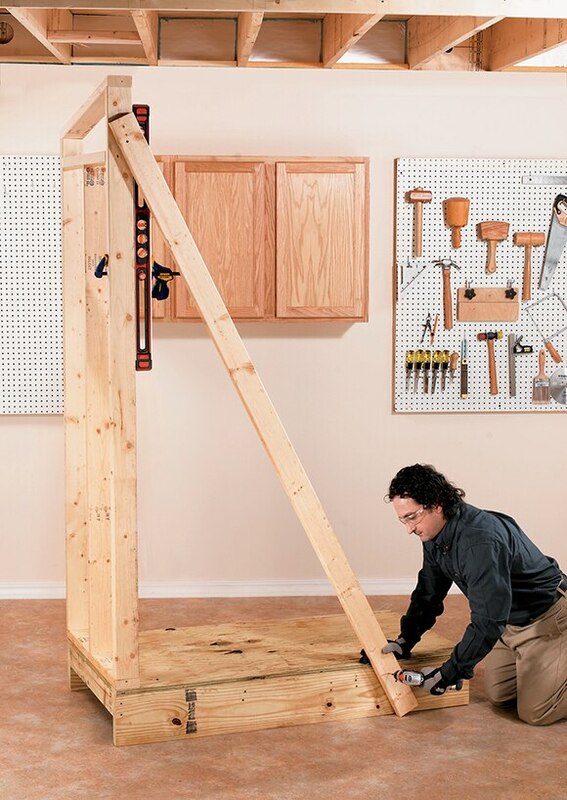 Attach the shed walls to one another and to the base platform with 21⁄2" screws. Use a square and level to check that the walls are plumb and square. Make the rafters. Cut the workpieces to length, then lay out and cut a birdsmouth notch in the bottom of the two inside rafters. These notches will keep the tops of the inside rafters in line with the outside rafters. The ends should be plumb-cut at 10°. Install rafter blocking. Some of the rafter blocking must be attached to the rafters by toe-screwing (driving screws at an angle). 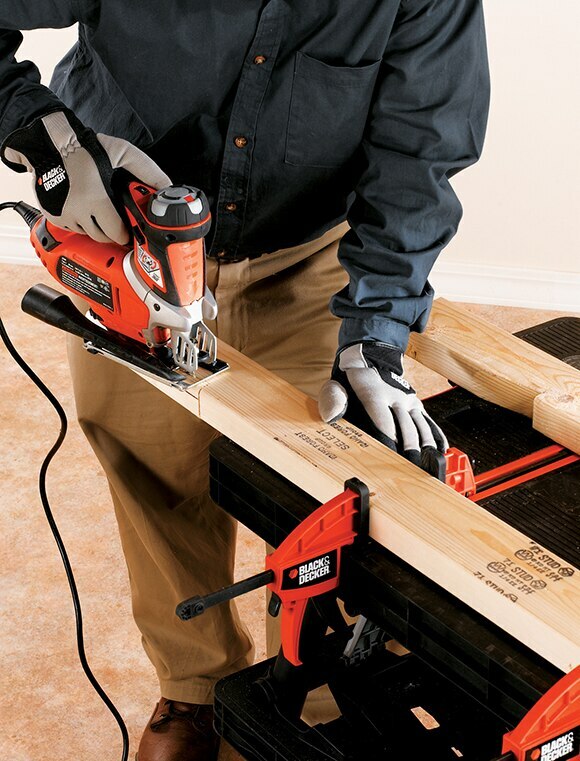 If you own a pocket screw jig you can use it to drill angled clearance holes for the deck screw heads. Install the roofing. Attach the corrugated roof panels with 1" neoprene gasket screws (sometimes called pole barn screws) driven through the panels at closure strip locations. Drill slightly oversized pilot holes for each screw and do not overdrive screws—it will compress the closure strips or even cause the panels to crack. Cut the wall panels. 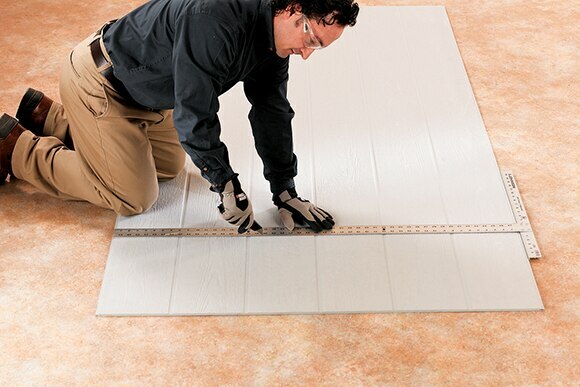 Use a utility knife to score the fiber-cement panel along a straightedge. Place a board under the scored line and then press down on the panel to break the panel as you would with drywall. Attach siding panels. 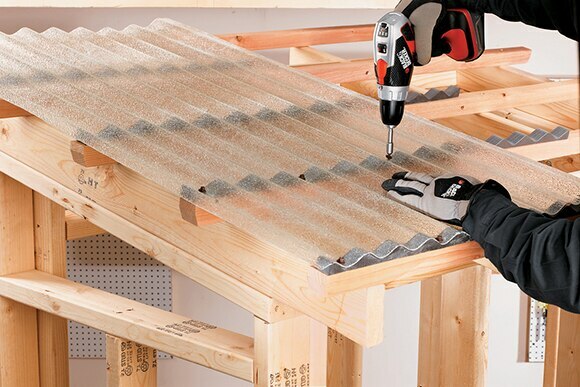 Attach the fiber-cement siding with 11⁄2" siding nails driven through pilot holes. Space the nails 8 to 12" apart. Drive the nails a minimum 3⁄8" away from the panel edges and 2" from the corners. Cut the acrylic window material to size. One way to accomplish this is to sandwich the acrylic between two sheets of scrap plywood and cut all three layers at once with a circular saw (straight cuts) or jigsaw. Attach the window panels. Drill a 1⁄4"-dia. pilot hole for each screw that fastens the window panels. These oversized holes give the plastic panel room to expand and contract. The edges of the windows (and the fasteners) will be covered by trim. Attach the trim boards with 2" galvanized finish nails. In the areas around windows, predrill for the nails so you don’t crack the acrylic. Hang the door using three exterior-rated door hinges. Slip a scrap of 1⁄4"-thick siding underneath the door to raise it off the bottom plate while you install it.